One of the many areas in which Bristol excels, alongside balloon fiestas, harbour festivals and street art, is craft beer. New establishments are popping up everywhere, showcasing the weirdest, wackiest and, most importantly, tastiest brews from near and far. Some have been critical of this upswing, but it is 100% fine by me. You can be a fan of traditional pubs and these new fangled craft beer hang outs. I know this, because I am one, and many others are too! Furthermore, as a budding connoisseur of all things hop, and a keen fan of having all my food and drink arrive on my doormat, when I saw that Beer52 were looking for people to review their beer delivery service, I was more than happy to volunteer. The opportunity to have 8 different craft beers delivered to my front door was too good to pass up, and having previously given a beer subscription as a Christmas present (Beer52 offer this service here) I was really keen to try it out for myself! I was flipping excited when they arrived, so much so that I spent several hours days researching and meticulously planning and pairing the beers with the perfect food accompaniments to really make the most of the review experience. I roped my OH in to help with the cooking by promising to share of all the beers, and having prepped a little 4 course menu to spread over the day, here is how we got on. After some extensive background work looking through all the beers, researching the styles and earnestly discussing food pairings, we chose the beer with a pig on the label. Because, pig. Setting aside the excellent, porcine themed label design, this is “Cerdos Voladores” from the Barcelona Craft Beer brewery, a zesty, fruity IPA of a style very much at the vanguard of the craft beer movement. As a fan of the city, I was keen to keep in the spirit of our Catalan chums and pair this with something typically Spanish. Hence, gambas et ajillo! That’s garlic prawns to me and Google Translate. From my admittedly limited knowledge of beer and food pairings, I know that your typical IPA is said to best be accompanied by a spicy dish, and so we went for this chilli infused creation. I can confirm that the taste makers don’t lie – the punchy, lemon-y flavours of the beer took the edge off the heat, whilst enhancing the sweetness of the dish. A light and refreshing lunch, especially when paired with a simple salad. From such big flavours, there was really only one direction to go; bigger. 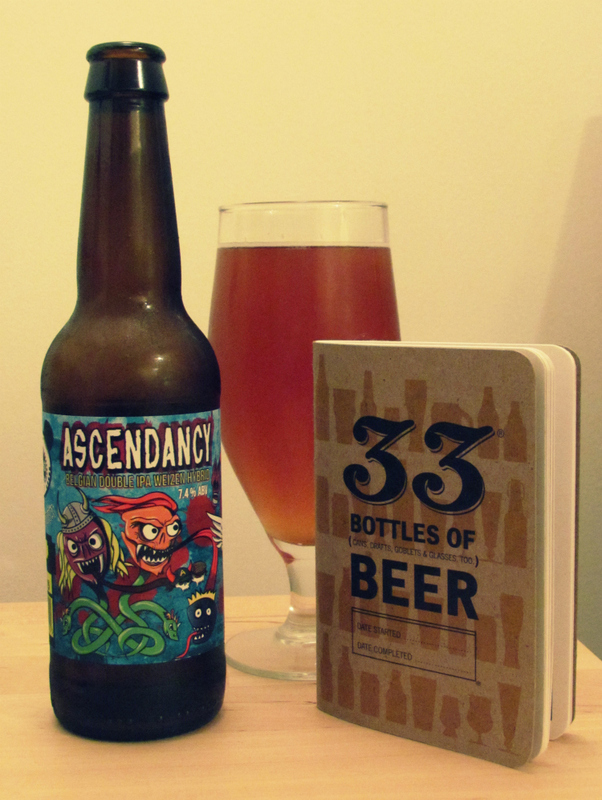 The second beer we chose (and not just for the equally excellent label art) was “Ascendancy” from the Panda Frog Project, an experimental offshoot brewery of North Tyneside’s Mordue. As a girl normally into her chocolate stouts, and one known to get a bit giddy at just the thought of a second round, I was a bit nervous about this higher ABV beast of a beer! Especially one described as a “Belgian Double IPA Weizen Hybrid”, I had no idea what to expect! After being assured by the OH that it would be a good ‘un, we dove on in, pairing this big flavoured brew with an equally big flavoured Teriyaki Chicken stir fry (with home made teriyaki sauce and garlic paste of course). I can confirm that the floral, tropical kick of the DIPA side of the beer was present and correct, a lovely thirst quencher after the spicy, marinaded chicken, and an appealing accompaniment to fresh crunchy peppers, bean sprouts, pak choi and red peppers. The “weizen” element (a traditionally German style of hazy wheat beer, brew fans) gave the beer more body than I was expecting, and helped to soften the impact of that big tropical tartness. Unusual, but highly recommended. And now we’re back in my comfort zone. For afters, we naturally opted for my go to sweet food of choice, the prince of puddings, the don of desserts, the sultan of sweets, the chocolate brownie. Paired, most appropriately, with the delicious coffee-infused Toasted Porter from Iceland’s Einstok brewery, a brewery from which I’ve tried and enjoyed beer from before when visiting Iceland. It was a satisfying and waist expandingly indulgent way to end a satisfying and waist expandingly indulgent day. As keen coffee fans (who, us? ), we even added a little local flavour to the brownie, sticking some of Extract Coffee Roasters‘ Kiangoi in the batter. The porter was smooth and rich, and unlike a lot of similar beers, neither too heavy nor overpowering. As we head into winter, I can imagine settling down in front of a Christmas box set or two with a bottle of this, idly sipping over the course of a few hours. Oh sorry, you didn’t think we were done did you? All that eating really made us work up an appetite, so a little more research later, and we found that you simply can’t enjoy an Oatmeal Stout without a good chunk of aged cheddar. So naturally, we followed this advice and opted for a simple, paired down snack of cheese and beer, using the Belhaven Brewery’s Scottish Oat Stout. The oatcakes, crackers, apple, pickles and chutneys just forced themselves on us, ok? Again, the tastemakers are on it with this – the velvet-y, silky texture of the stout was a nice base for the strong cheese. As a person not normally into such cheese, I was surprised and impressed! This was another delicious beer from the darker end of the scale, perfect for warming one’s cockles by the fire candle on a cold night. Thanks Beer52 for expanding my beery horizons and for giving me a good excuse to get creative in the kitchen! If you fancy having a little tasting session yourself and want a cheeky discount code, just pop SHEANDHEM10 into the ‘got a special code’ box on the Beer52 website for £10 off of your order. Also, if you would like any of the recipes for the food items in this post, please get in touch! Happy Friday everyone! Most Fridays upon finishing work we head to an all night disco party home, put our pyjamas on and drink all of the gin. Sometimes with friends, but usually alone with our cats. Luckily, when we can persuade our pals (they do exist, honest!) to hang out with us, they all love a simple G&T too. Very fortunate, as we can be predictably lazy when it comes to the art of mixology. However, last weekend we decided to step out of our boozy comfort zone and hit the hard stuff. Fruity pink cocktails! When excitedly hitting the supermarket, we quickly realised that neither of us really knew how to make anything other than a snowball, so we had a little helping hand from the experts at thebar.com. Luckily for us, thebar.com is really simple to use, with a handy search function on the main page, you just type in a spirit that you like (it doesn’t have to be gin!) or a cocktail you would like to try and hundreds of tasty recipes will pop up in seconds. As most have been sent in by members of the site, there are lots of fun ideas with suitably charming names, and well, they just all look so pretty. 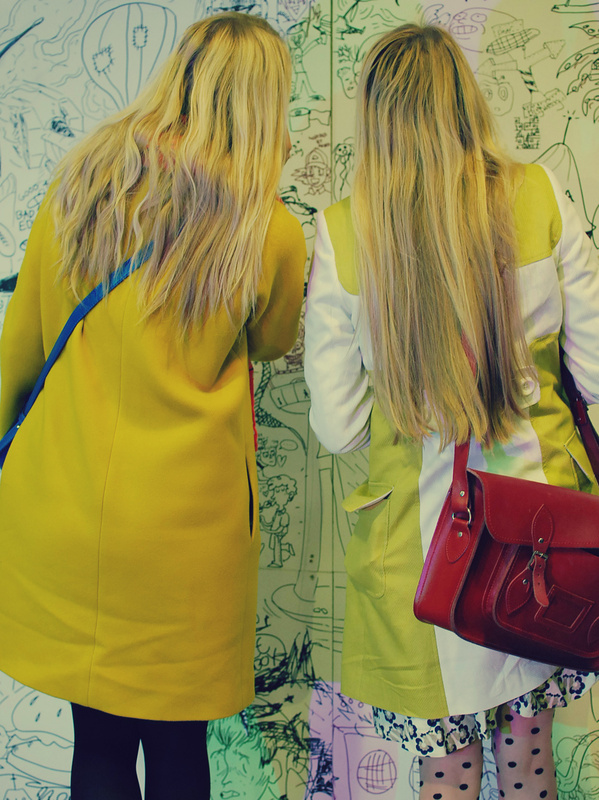 As a gift to you our loyal readers, we decided to try and throw ourselves a She and Hem style cocktail party. With added massive birthday cake. No, it wasn’t anyone’s birthday, we just like massive cakes, ok? After lining up our top three cocktails from the evening, there was no clutching at straws and, in a strong field of creatively named confections, the clear winner was the decidedly more Ronseal Archers Peach Schnapps & Cranberry Juice. Easy to make, refreshing and fun. It was sodalicious!